This week already saw the discovery of a famous lost Kerouac letter. Now we can add a previously unknown First Folio to the tally. Shakespeare’s First Folio - containing 36 of his 38 known plays and printed in 1623 - is one of the most valuable books in English literature. It’s also one of the most closely inventoried. 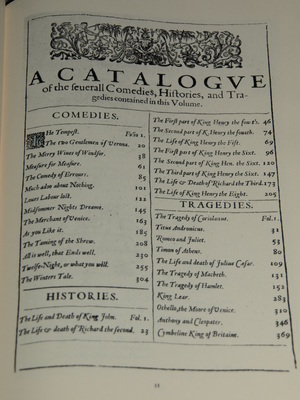 Of the 800 copies thought to have been originally printed in the 17th century, 233 are believed to still exist today. And now we can add the 234th to the list. This particular First Folio has lain dormant in the library of Saint-Omer, an obscure French town near Calais, for over two hundred years. Medieval literature expert and librarian Rémy Cordonnier stumbled across the book while searching for items to use in a planned exhibition of Anglo-Saxon authors. Cordonnier then reached out to American professor Eric Rasmussen for verification. Rasmussen, affiliated with the University of Nevada, was in Britain at the time to study at the British Library. Rasumussen quickly hopped on a train to France. After arriving at Saint-Omer, Rasumussen authenticated in the First Folio in a matter of minutes. Needless to say, the book will become the centerpiece of the Anglo-Saxon exhibition at the library next summer. In the meantime, don’t sit around waiting for the next First Folio to be unearthed. Their average rate of discovery? Once every ten years. Shakespeare's First Folio - containing 36 of his 38 known plays and printed in 1623 - is one of the most valuable books in English literature. It's also one of the most closely inventoried. Of the 800 copies thought to have been originally printed in the 17th century, 233 are believed to still exist today. And now we can add the 234th to the list. "It had been wrongly identified in our catalogue as a book of Shakespeare plays most likely dating from the 18th century," Cordonnier said in an interview with The Guardian. "I didn't instantly recognise it as a book of value. It had been heavily used and was damaged. It had seen better days... [But] it occurred to me that it could be an unidentified First Folio, with historic importance and great intellectual value." "This is huge," Rasmussen said in an interview with The New York Times. "First folios don't turn up very often, and when they do, it's usually a really chewed up, uninteresting copy. But this one is magnificent." In the meantime, don't sit around waiting for the next First Folio to be unearthed. Their average rate of discovery? Once every ten years.